Home / bobrisky / Entertainment / fashion / followers / Instagram / Lifestyle / news / Nigeria / nigerian entertainment makeup / "You're mad, use your unfollow button Fool" - Bobrisky replies a 'Follower'. "You're mad, use your unfollow button Fool" - Bobrisky replies a 'Follower'. 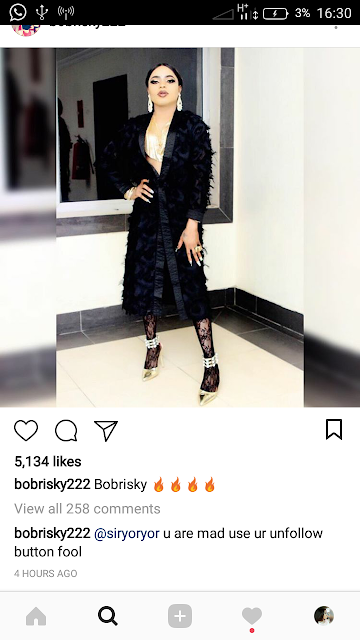 Bobrisky aka Oseyy Baddest! seem not to be having it easy with some of his 400k followers on Instagram. Bobrisky didn't take it lightly with some of the harsh comments and in replying one of them he wrote "you're mad, use your unfollow button fool" . Meaning the person follower should unfolow him.